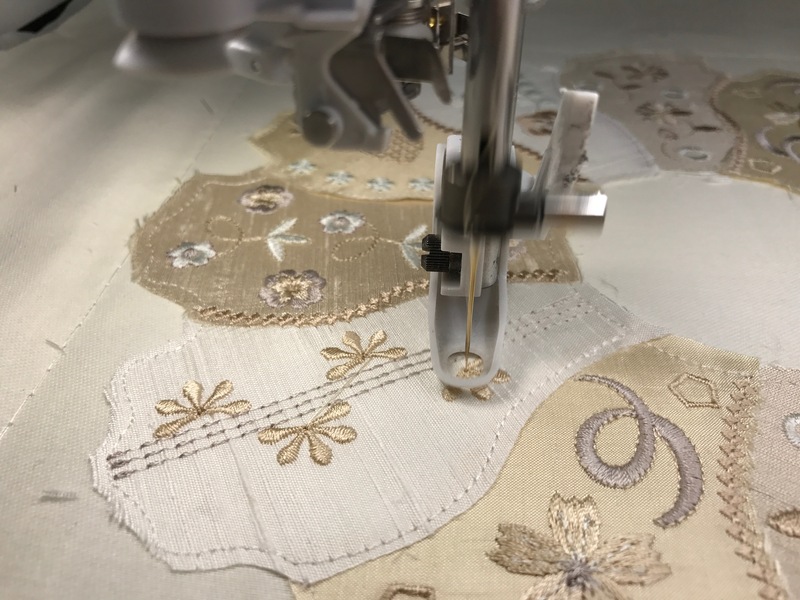 I just adore creating crazy quilt blocks as attaching the small segments of fabric in a sequence results in beautiful embroidery. 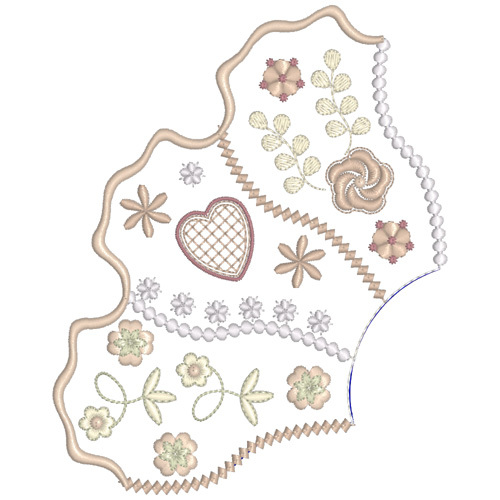 Within the block there is a place to treasure forever those tiny scraps of fabric or lace that you could not bear to throw away. 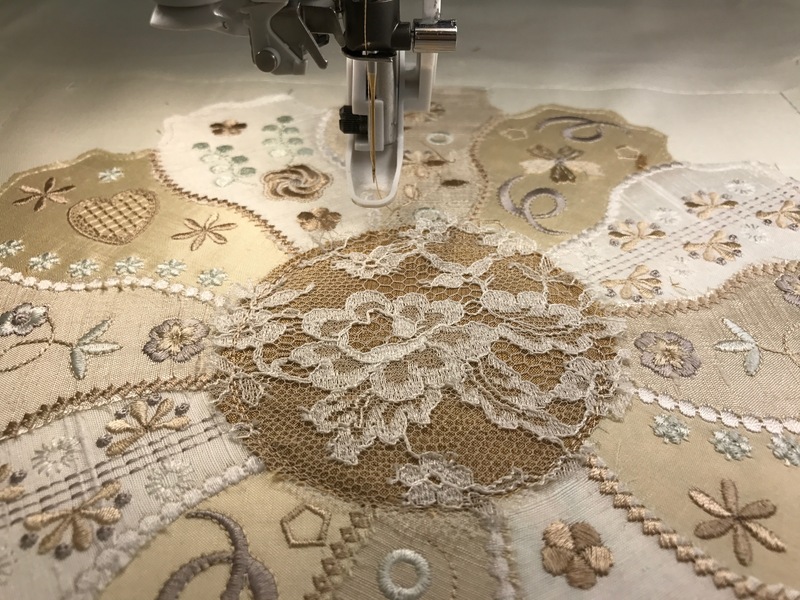 I think it is the mixture of fabric and embroidery thread which makes them all the more delightful, and each block is unique, personal. 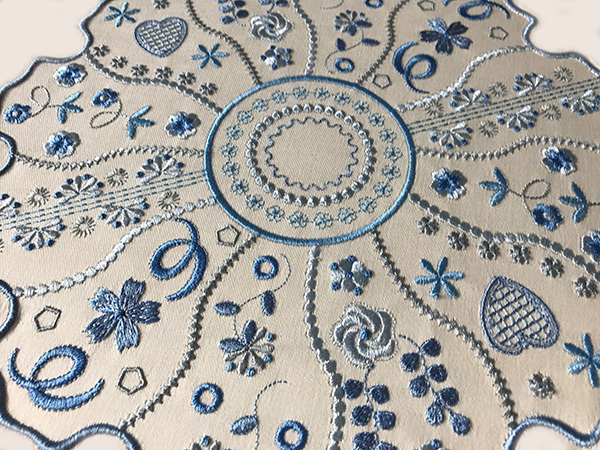 My first stitch out was done to test the embroidery, without attaching the various fabrics, just on white cotton in pretty shades of blue, like a china plate…..
My next stitch out was done with three shades of silk dupion and only a few neutral shades and a dash of colour. 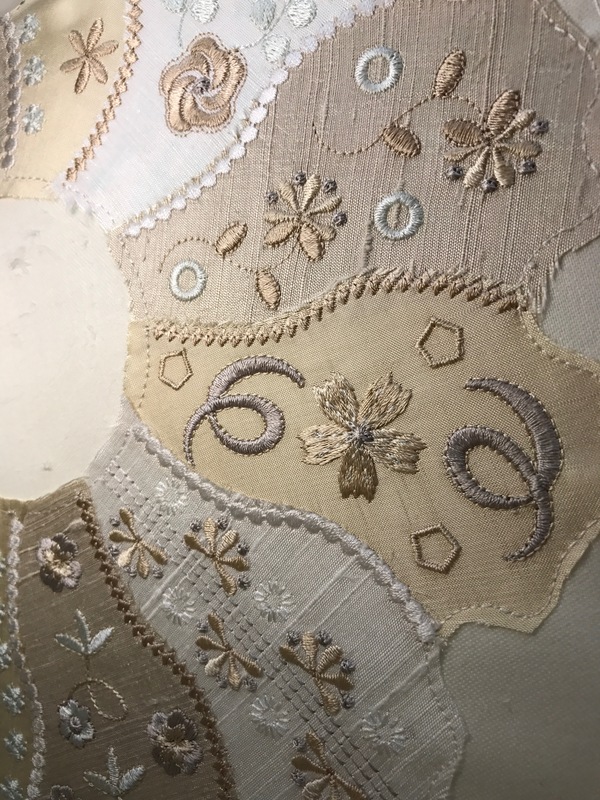 As there are 12 segments of this Dresden style quilt block, the ivory, beige and pale gold silk were added in sequence four times. 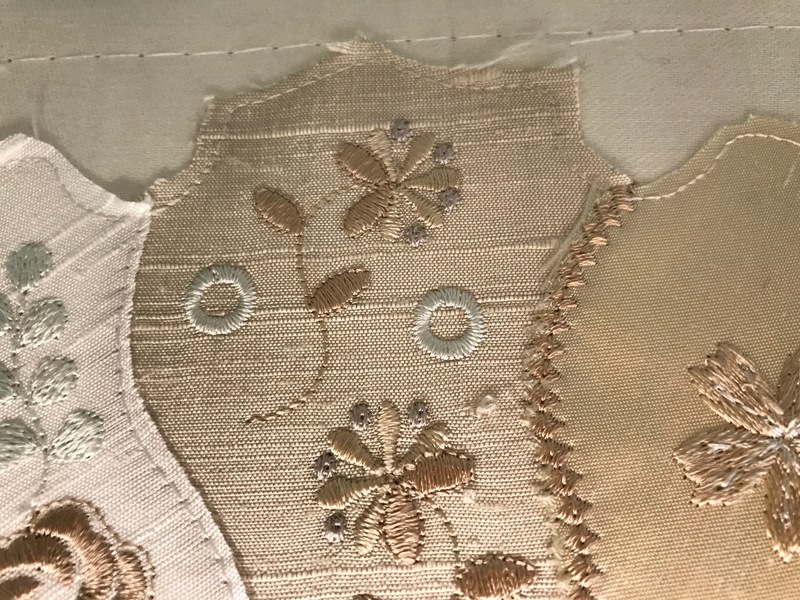 There are six different embroidered segments so each opposite pair are identical, and the silk is the same too using this method. If you used only two shades of fabric you would get a very different look. 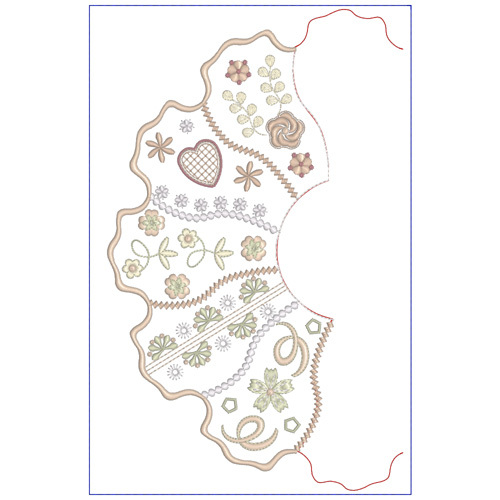 I prefer to use silk dupion for my crazy quilt blocks as I am able to use every little piece from my stash. 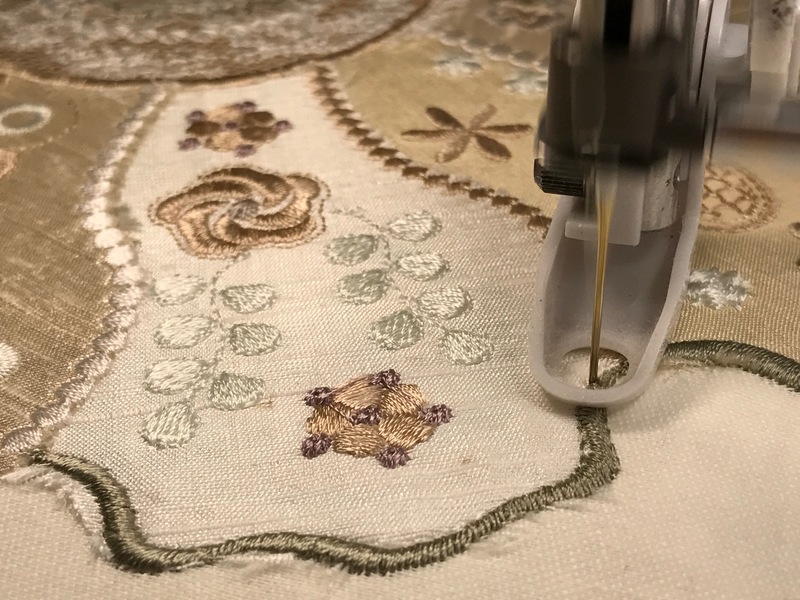 Although silk has a tendency to fray as you can see here in this photo, I find that an advantage as trimming it after the embroidery is complete is much easier, providing I use very sharp scissors under my magnified light. 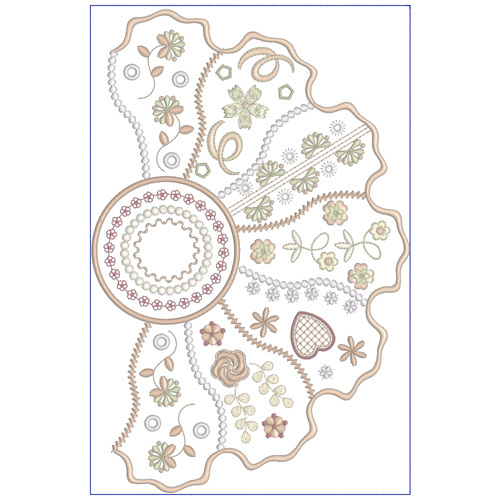 Although I have only chosen a few colours for this delightful quilt block I have digitised it in such a way that you can add more colours easily. Each design will be available with its colours sorted and unsorted. 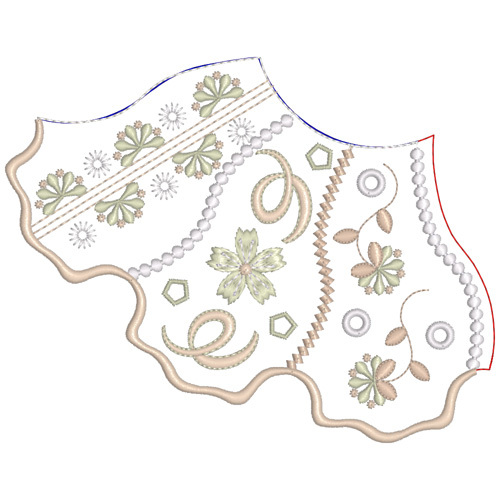 In embroidery software “colour sorting” is where the number of colours is reduced to the minimum number of colour blocks possible. When I do this it makes it difficult to add extra colours. There is a little more shaping to each segment in this block so the edges need to be carefully trimmed, but the overall look is exactly what I had in mind when I started to digitise it. 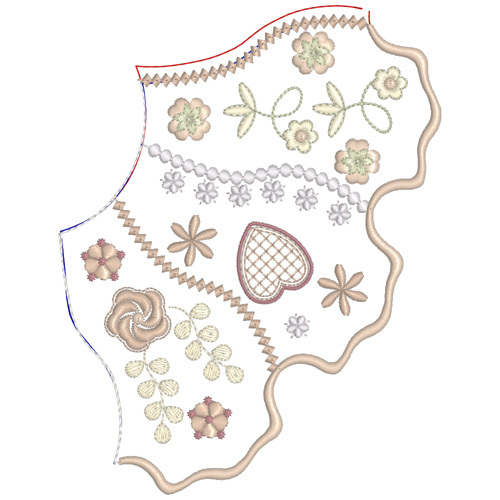 You won’t be surprised to know that I already have an idea for the next “Dresden” style crazy quilt block. In these photos you can see that I have stitched the whole design in the Imperial 360 mm x 260 mm hoop but not to worry if you don’t have that hoop. 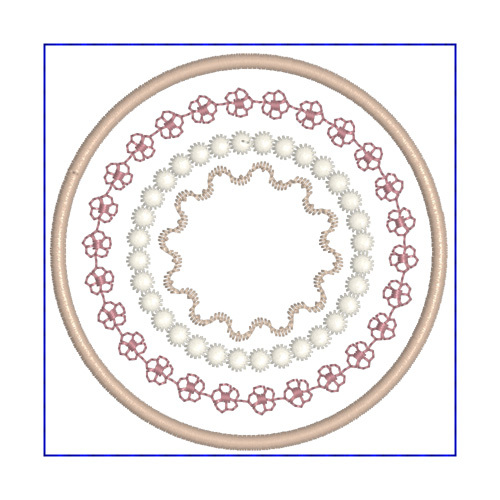 With a 12″ by 8″ hoop the block can be stitched in 2 hoopings as shown below, and there are plenty of instructions and guidelines to help you. The block has also been split into 5 designs for 5″ by 7″ hoops. Here a few of few photos of my block showing how it developed. 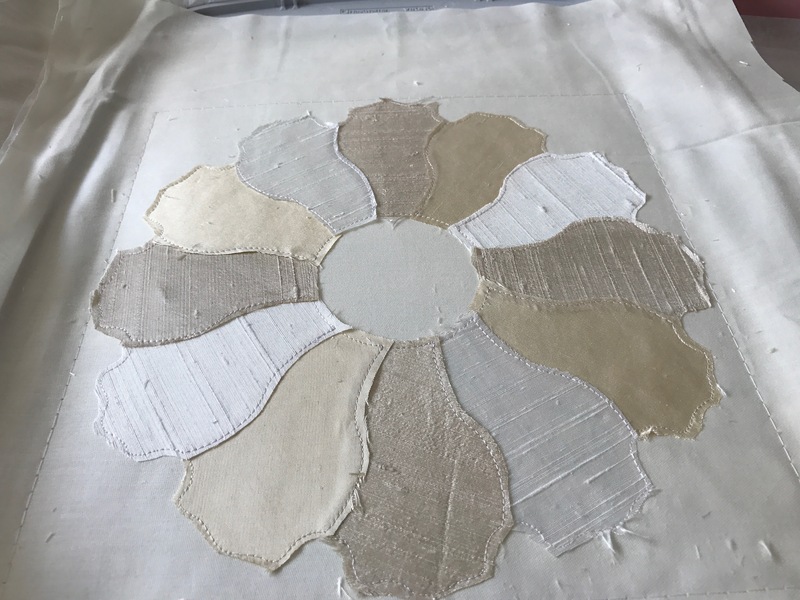 Once the segments were embroidered I had to add the centre fabric piece. 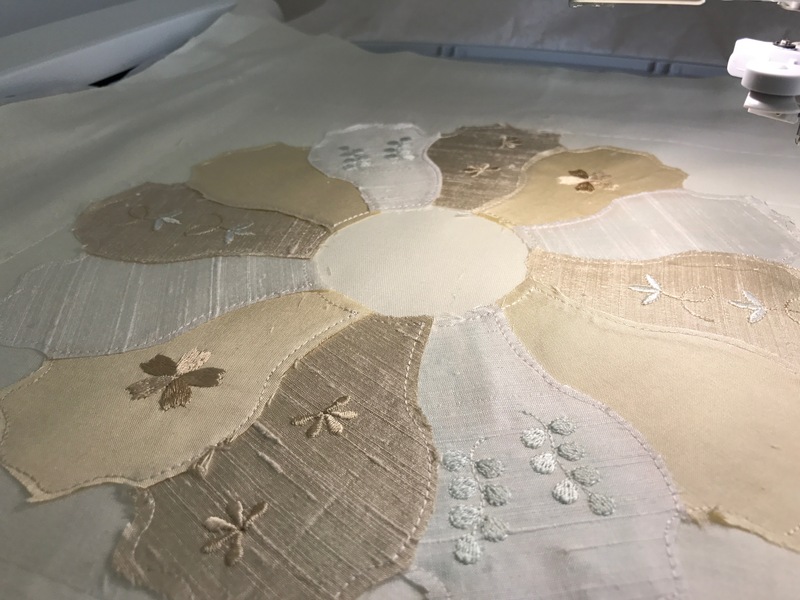 As I used a darker gold I overlaid it with some beautiful lace which lightened the gold perfectly. As you can see here I left most of my trimming until afterwards. The outer satin stitches on this block are a double satin so they are quite raised. 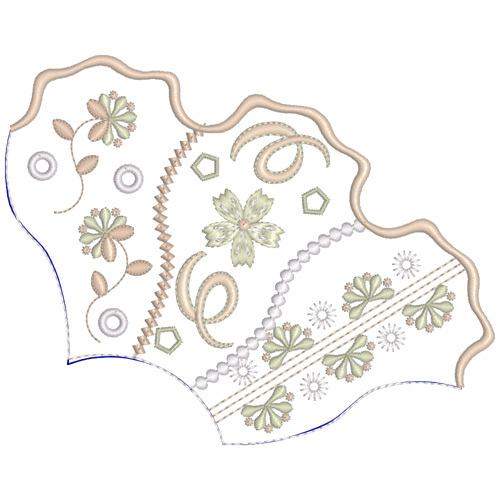 This is a new stitch that came with the latest upgrade in my Wilcom software. It is wonderful and I love it. This is my finished quilt block ready to be neatened and embellished. 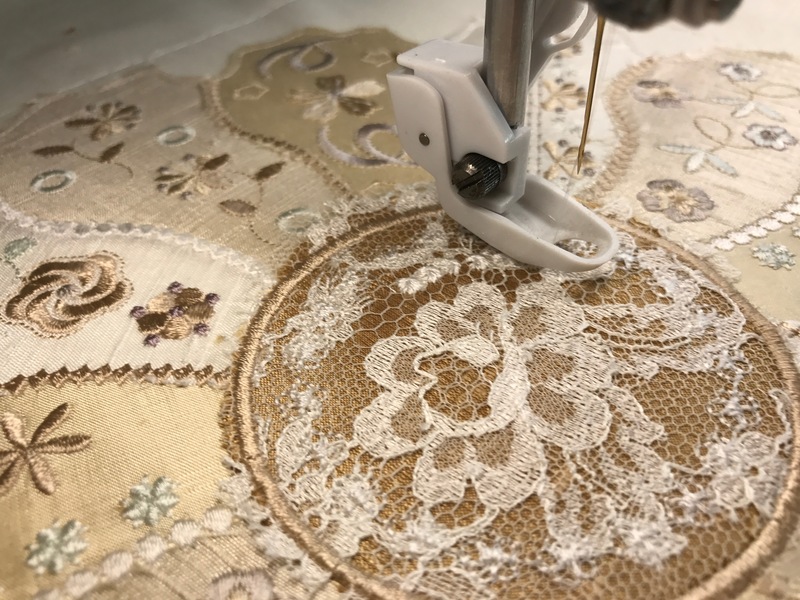 As I admired these sumptuous colours with the silk and lace, it occurred to me that the elements in this block would make a wonderful bridal collection! Let me know what you think please. 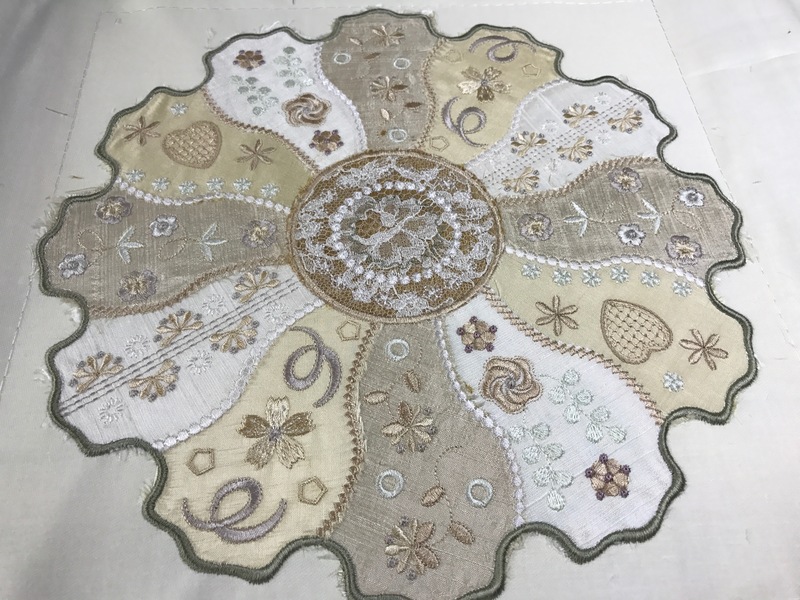 This entry was posted in Discussing machine embroidery, New Designs and tagged Crazy quilting, development of embroidery, embroidery on silk, machine embroidery, quilt blocks, The importance of colour. Bookmark the permalink. 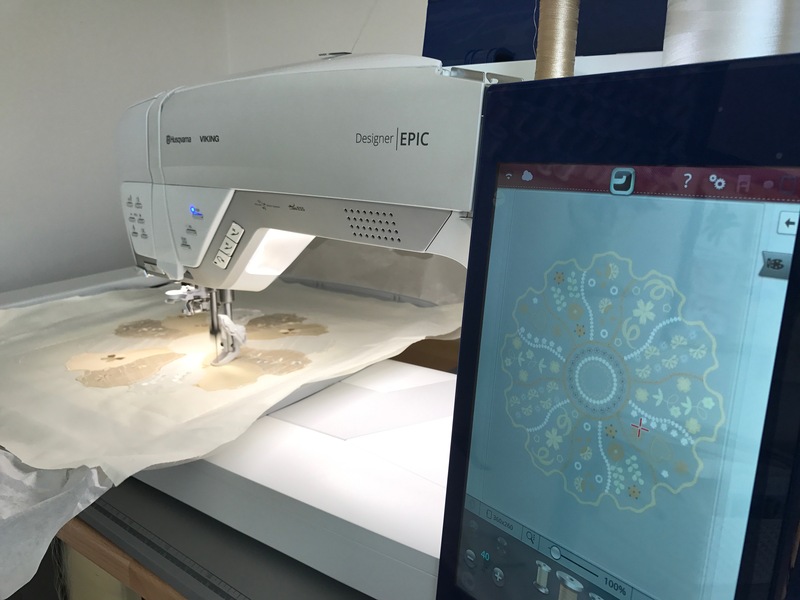 You are obviously in love with this lovely method of quilting. What a gorgeous block this is. So well-researched, and the color combos are fantastic. Congratulations on a job well-begun! What we are is GOD’s gift to us; what we become is our gift to HIM. There are 2 types of silk dupion, smooth and stubby. I prefer the later which tends to fray more as some of the fibres are thicker and coarser. I love its imperfections and it tends to crease less than the smooth silk. No I don’t use iron on stabiliser. I use one layer of tear away. Hi Meg, Just now reading this but hope you find it helpful. Before hooping I usually back all my silk with either fusible weft or a very light weight product made specifically for machine embroidery. This product goes by several different names depending on the manufacturer One made by Jenny Haskins is called Sheer Magic. Floriani has an equivalent. Babylock and Allstitch also have equivalents. 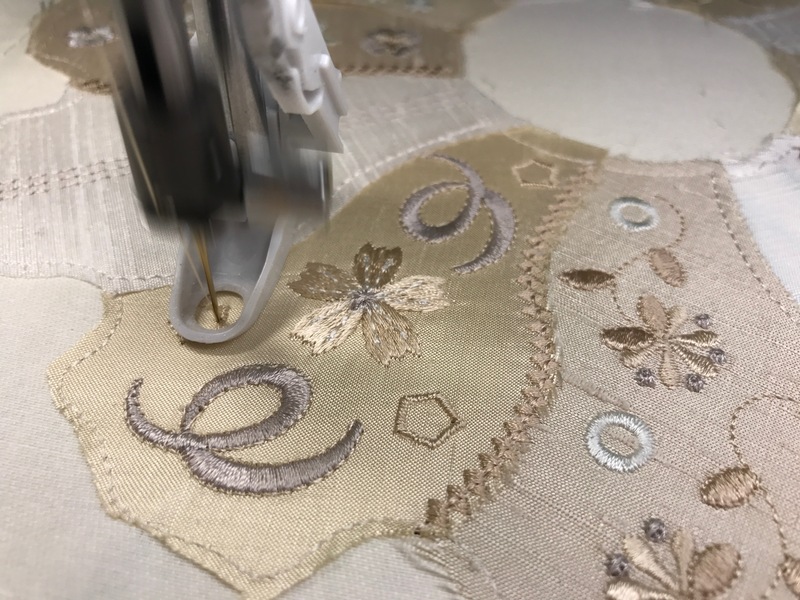 These are not stabilizers but instead provide extra fabric thread count so there is less fraying/shredding of delicate fabrics without changing the drape of the original fabric. I get very good results with these light weight products. Some people have used fusible tricot but I find the tricot is not as light weight and can slightly alter the hand/weight of the fabric. Amazing. I love looking at your various stitch combinations and Crazy Patch is a love of mine. This is one of the most beautiful blocks that I’ve ever seen. Absolutely exquisite!!!!!!!!!!!!!! !